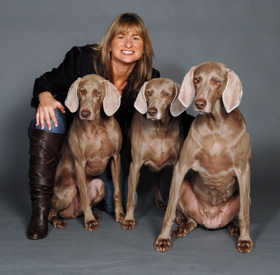 Cis Frankel is a Chicago-based canine behaviorist, award-winning author, and recognized Breeder of Champion Weimaraners. She is honored by the American Kennel Club as breeder, owner, and handler. Her specialty is training dogs for a safe life in urban settings. Frankel founded the Canine Intelligence Agency® (CIA) in 1989. Over the past 26 years, Frankel has trained more than 20,000 dog owners and their pets. She also trained Oprah Winfrey’s Cocker Spaniels, Solomon and Sophie. She serves as a frequent consultant to veterinarians on canine temperament and behavior. She has successfully treated a wide range of canine behavior problems including: aggression, fear, separation anxiety, shyness and hyperactivity. Frankel has an uncanny ability to holistically train canine companions and their owners so that they can “Live, Love and Laugh” in any environment. Her proprietary Urban Dog Street Smarts Training and behavioral methodology is self developed and unique in the canine training industry. Frankel’s highly acclaimed book, “Urban Dog: The Ultimate Street Smarts Training Manual,” was awarded Best Book on Training and Behavior for 2001 from the Dog Writers Association of America. It is an integrated part of her training curriculum, and serves as her written training manual for all levels of classes. Some of Frankel’s canine advice has been featured in the Chicago Tribune, Chicago Sun-Times, Chicago Magazine, and radio programs throughout America. She has also appeared on Oprah as well as numerous television shows on NBC, WGN, ABC, CBS, CLTV, and Fox Television. She has trained dogs for use on television shows, in theatre, and for television commercials. Frankel can often be seen navigating the streets in Chicago with her well-behaved Weimaraners. They are always practicing street-smart training in many different environments throughout the city.